Metro Train to the BETHESDA Metro Station on the RED LINE. ( Tip: Please use the elevator because it places you at the intersection of Montgomery Ave and Wisconsin Ave, using the escalators considerably lengthens your walk). 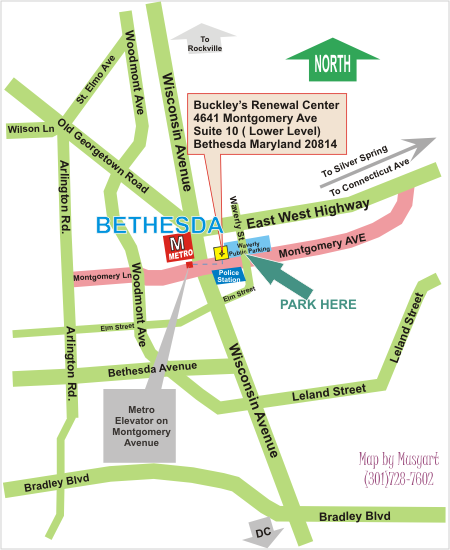 Parking: We recommend that you park on the Higher Levels of the Waverly Street Parking Garage that is situated right next to Buckley’s Renewal Center. This garage accepts coins and the long term parking cost about 65 cents a hour. The closest cross street is Wisconsin Ave and Montgomery Ave..